Dienten is a village in the Hochkönig region of Salzburg′s Pinzgau area. The Hochkönig is a mountain that is almost 3,000 metres high and famous for its glacier and summer skiing opportunities. Dienten itself is a popular skiing town and busy throughout the winter. During the summer season, Mount Hochkönig and his buddies offer plenty of hiking opportunities. In addition, local hotels have increasingly specialised in "wellness" or spa holidays. Historically, Dienten was an important centre of iron ore mining. The iron ore mines were closed only in 1964. Since then, the population has decreased a lot to currently approximately 780. This population is divided up into several hamlets, resulting in a community that is pretty much as far from urban as possible. However, the development of skiing tourism at least halted the economic downwards trend that troubled the village in the 1960ies and today, what is left of Dienten is rather wealthy again. Dienten is part of the skiing area Hochkönig′s Winterreich, a once small but exclusive skiing area in association with Mühlbach and Maria Alm. All three towns are very important skiing towns and members of the Ski Amade, the biggest skiing area in Austria (by its own definition) and one of the biggest in Europe. In terms of sightseeing, Dienten has not much to offer. Hikers will get by several artefacts from the mining past of Dienten, such as abandoned houses. Note also an ancient toll station and a few scenic bridges. Otherwise, you are lucky to find a shop where you can get groceries - it is skiing and nature experiences that draw people to Dienten, not culture and urban delights. 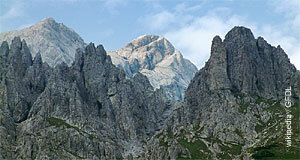 A nice factoid about Dienten and the Hochkönig area is the legend of the drowned Alm (mountain cabin). Almen were huts that provided a base for shepherds during the summer, which allowed cattle to get access to pastures in high altitudes. The cattle was taken up in early summer and returned to the valley in September. Almen had to provide a living and work environment for those seasonal workers that looked after the animals and processed the milk into cheese and other specialities. Some Almen were more prosperous than others - legend has it that one of Dienten was particularly rich. The staff grew fat and lazy on all the goods they produced. Once they had more cheese and other dairy products they would need to sell, they even cobbled the road that led to the Alm with loafs of cheese and filled the gaps with butter. One night, a storm broke out when the staff was celebrating a wild party. From the area of today′s Dienten, a tiny old man climbed up the cliffs and asked the inhabitants of the Alm for shelter. They ridiculed him and sent him back out to the storm. Bad luck, since the little old man happened to be a Kasermandl, a mountain demon or gnome and recurring theme in Austria′s pagan heritage. The humiliated Kasermandl was furious and cursed the Alm. The storm turned into a blizzard, snow fell in enormous amounts, covered the Alm and much of the Hochkönig. All of the staff drowned in the masses of snow and when the sun rose, the Hochkönig was covered by a glacier. Which is good for Dienten and its neighbouring skiing areas. Let′s return to facts: During Antiquity, many Almen were maintained at altitudes higher than Dienten. Most of them had to be given up in the Middle Ages, when temperatures dropped and the glaciers extended. Some historians believe that this is the origin of the legend retold above in admittedly clumsy English.